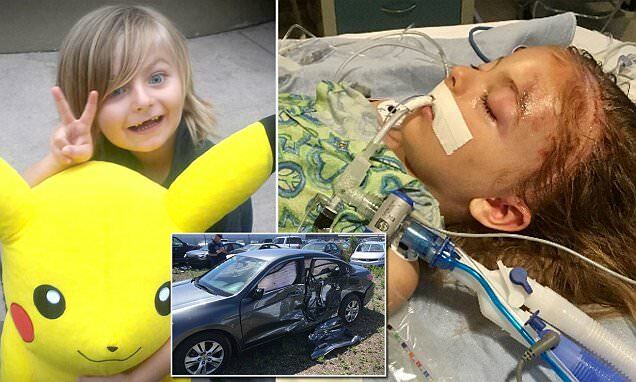 A suspect in a drunken-driving hit-and-run accident in California that sent a 6-year-old boy to the hospital with severe head trauma over the weekend was an illegal immigrant with a criminal history who has been deported from the US at least 15 times. Constantino Banda-Acosta, 38, has been arrested and charged with DUI resulting in bodily injury, hit-and-run with an injury - both felonies - and a misdemeanor driving without a license in connection to a crash that took place in San Ysidro Saturday night. According to police, Banda-Acosta was driving his Chevy Silverado pickup truck at a high rate of speed on Camino de La Plaza at around 11.30pm when he blew past a stop sign at Dairy Mart Road and smashed into a Honda Accord carrying the Lake family, who were returning home from a trip to Disneyland. The collision took place just a block away from the family's home. The driver of the speeding pickup truck did not pull over to render aid, officials said. The victims' Honda Accord sustained the heaviest damage on the driver and rear passenger’s side, where Lennox Lake was riding in his car seat, relatives told the San Diego Union-Tribune. Ingrid Lake, the boy's mother, scrambled out of the car and rushed to her son, who was unconscious, not breathing and bleeding from his nose, ears and a wound on his head. Oh, if only that car could have instead been carrying Hillary Clinton, Mayor Garcetti, Jerry Brown and Nancy Pelosi. Which one would you put in the car seat? @ObjectiveObserver This is so tragic and could have been prevented if California cared about it's own citizens and enforced it's immigration laws! @hunny21 Odd reasoning, Trump wants to stop the problem, while Hillary wants to make it worse. Maybe it only matters if it is your family?